Let’s set forth on a tour amidst agricultural terraces, walnut groves, burial caves carved into boulders, and beautiful blossoms, as we discover the secret charms of springtime in Jerusalem. Along the northern reaches of Nahal Refa’im, between Ir Ganim and Givat Masua, we see a panorama of the <?xml:namespace prefix = st1 ns = "urn:schemas-microsoft-com:office:smarttags" />Jerusalem hills and the White Valley. One white mountain ridge that overlooks the valley was “saved” from westward urban development, thus offering us scenic nature views within the municipal territory. 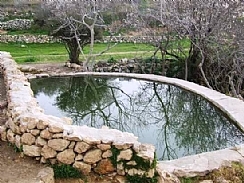 We will hear about a mysterious archeological site, biblical agricultural workers, and ancient tombs between the orchard and the mountain spring.